Our doctors will discuss the benefits, risks and complications of any glaucoma treatments with you during your appointment. Initial options in the treatment of glaucoma typically include pressure lowering drops and/or laser treatment. 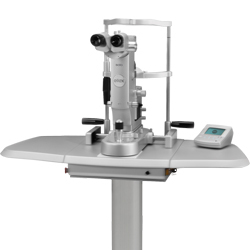 Drops commonly work by decreasing the amount of fluid produced by the eye, which usually results in lower pressures. Medications can also increase the amount of fluid that leaves the eye. While drops cannot cure the disease, in most cases, the use of these medicated eye drops can slow or halt the worsening of glaucoma. There are 256 combinations of drops that can be used and as a result surgery is not frequently needed. If drops do not provide sufficient treatment, laser therapy in the form of an argon laser trabeculoplasty or selective laser trabeculoplasty, may be recommended. Our doctors will speak with you and help you understand your glaucoma and which options will be best for your situation. At EPLB, we can perform both Argon and Selective laser trabeculoplasty. The both involve increasing the flow of fluid out of the eye. The benefits of SLT include the fact that it can be repeated and causes less damage to the drainage system of the eye. In the case of angle closure, the physician will need to remove the blockage to reduce the pressure. In this case, a peripheral iridotomy or a peripheral iridoplasty are more appropriate. In both cases, the purpose of the laser is to pull the iris away from the angle. In a peripheral iridotomy, the surgeon will create a small opening in the peripheral iris and stabilize the pressure behind and in front of the iris, pushing the iris back. This works when the mechanism of angle closure is that the pupil gets too close to the lens, preventing the fluid from behind the iris to come around, causing a buildup behind the iris. The laser creates a new path for fluid and releases the increased pressure. In a peripheral iridoplasty, the laser is used to shrink the mid peripheral iris, pulling it away from the drainage system. The next level of therapy if laser and eyedrops fail, consists of incisional surgery, or surgery that involves cutting. Our doctors may recommend one of a variety of surgical procedures for the treatment of your glaucoma, and a trabeculectomy is one of the available options. A small incision will be made into the drainage system of the eye and a new channel for the fluid created, which then flows under or oozes through the conjunctiva. This allows for increased ouflow of fluid and a reduction in pressure. A small bubble will appear on the conjunctiva at the point of intersection of the cornea and the sclera. Other surgical procedures include trabectome, goniotomy, canaloplasty, and endoscopic cyclophotocoagulation. Other options include shunts are small artificial devices that are surgically attached to the eye’s surface for treatment of glaucoma. The devices have a tiny tube that is inserted in the eye and creates a passageway for the fluid to escape. The shunts and implants allow fluid to escape the eye without having to pass through the damaged trabecular meshwork. Shunts are made of materials such as polypropylene and silicone and depending on the type of glaucoma, the shunts may either be hollow to improve drainage or have valves to control the drainage. The main shunts used are Baerveldt shunts (no valve) or an Ahmed shunts which have a valve. A newer shunt is the Express Shunt. This procedures combines the benefits of a shunt with that of a trabeculectomy. A low power laser with a very short pulse of light, the SLT laser is applied directly to the trabecular meshwork to enhance or stimulate its normal drainage function. The laser causes a drop in IOP without cutting tissue or creating new holes or openings in the eye. SLT treatment offers many advantages to patients. It can be performed as an initial treatment instead of eye drops for patients who cannot tolerate medications or who desire fewer or no medications. It can be added to drops as a supplemental treatment for greater IOP lowering when necessary, allowing for less complex medical regimens. There are no systemic side effects. It is a safe, office-based procedure, performed simply with a drop of anesthetic in the eye. It is reimbursed by medical insurance. In some patients, the IOP lowering effect of the SLT laser may wear off over time, requiring a retreatment with the laser or a different therapeutic approach. SLT may be performed prior to cataract surgery in patients with coexisting glaucoma and cataract to maximize the chances of good IOP control with less need for glaucoma medications following cataract surgery. One of the latest developments in the treatment of glaucoma is the use of the Express Shunt. The ExPress mini-glaucoma shunt a miniature stainless steel device that offers an additional option when treating difficult glaucoma cases. The shunt is as small as a grain of rice and is a hollow drainage tube that enables the drainage system of the eye, which as been damaged by glaucoma, to be bypassed, in turn lowering intraocular pressure in the eye. Generally when medical and laser therapy for glaucoma fails, some type of filtration surgery is the next step taken. 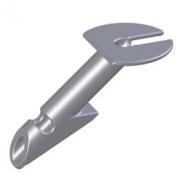 The ExPress shunt provides immediate consistent aqueous flow through a microscopic opening. To place the shunt, a thin flap is cut into the front of the eye. Next, a hollow needle is inserted through the eye, into the anterior chamber. Then, the ExPress shunt is placed into the hole created by the needle. Once the shunt is in place, the flap is closed and secured with tiny sutures. Fluid can then freely flow out of the eye, equalizing pressure within the eye. The procedure takes about 10 minutes to perform and is an outpatient procedure, meaning the patient will return home the day of surgery. After surgery quality of life is greatly improved as patients have minimal pain and discomfort and are able to see well after surgery. With traditional surgeries to treat glaucoma, healing time can take weeks. Placement if the Express shunt causes less disruption to the eye tissue so patients are much less likely to experience problems associated with standard surgery such as drooping of the eyelids. In many cases, patients that have had ExPress Shunt surgery are able to cut down or even eliminate medications and eye drops to control intraocular pressure. Canaloplasty is a breakthrough procedure available to help patients who may be frustrated with their medications and aren’t ready for traditional surgery. Canaloplasty is proven to safely lower intraocular pressure (IOP) and dependence on medications. And unlike traditional procedures, Canaloplasty uses a less invasive, non-penetrating approach and has fewer complications and less follow-up. Canaloplasty is a newer surgical method, similar to a trabeculectomy, except for the important distinction that the final thin layer of the wall of the eye is left intact. A microcatheter is used to dilate Schlem’s Canal and a small suture is used to stent the canal open to allow the natural filtration channels in the eye to re-open. This procedure lowers the chances for infection, and is ideal for patients not wanting to under go traditional filtering surgery or can no longer tolerate eye drops. If your doctor has recommended that you undergo cataract surgery, it is likely that your vision has been a challenge for some time. As a result of this procedure, your cataract will be removed and replaced by an artificial intraocular lens or IOL. It is also likely that you and your doctor had discussed that you had mild to moderate open angle glaucoma. This type of glaucoma is most common and occurs when pressure in the eye builds to above normal levels. This pressure, also referred to as intraocular pressure, may rise when the drainage system in the eye is clogged, which causes an excess of fluid in the eye. High intraocular pressure can potentially lead to permanent vision loss. Unlike cataracts, there is no cure for glaucoma. It is a lifelong disease that must be carefully monitored to limit vision loss which cannot be regained. Most people take one, two, or even three glaucoma medications daily to control intraocular pressure. 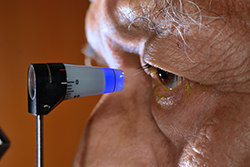 Today, however, a new technology can change how you manage your glaucoma. The FDA approved iStent implant is the world’s smallest medical device and can be surgically placed into your eye. The iStent device is designed to lower intraocular pressure and some patients may experience a reduction in their glaucoma medications, but this will be at the discretion of the physician managing your glaucoma. The iStent implant works by improving the eyes natural ability to direct fluid flow through the trabecular meshwork, which is the anatomy through which fluid exits the eye. Most of the fluid in your eye naturally drains through this meshwork and into the bloodstream through a structure called Schlemm’s Canal. When this outflow system becomes blocked, the pressure in your eye increases. The iStent implant is designed to bypass the blockage within the trabecular meshwork and improve the natural flow of fluid out of the eye. The iStent procedure is minimally invasive and is performed at the same time as the cataract surgery. After implanting the IOL, your doctor will insert the iStent implant through the same incision that was created for your cataract procedure. No additional anesthesia or surgical materials are required for the procedure. 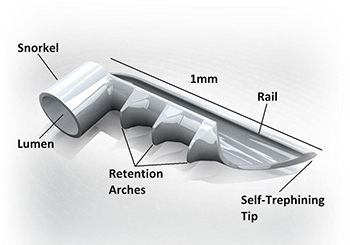 The iStent implant is inserted through the trabecular meshwork to create a bypass channel that allows fluid to drain into Schlemm’s Canal and into the bloodstream. By lowering eye pressure, the iStent implant may reduce your need for glaucoma medications. Ask your doctor today about the iStent implant. It may be a solution to manage your glaucoma and to regain the freedom you deserve.